Chris Briem put together this cool visualization (50 MB PDF) showing the Size of Governments in the US, where the number of employees is proportional to the font width. Explained here. I only wish it were searchable. This might be useful to look at as a Cartogram. But I don’t know if cartograms can handle hierarchical and overlapping jurisdictions (Minneapolis School District is in Minneapolis is in Hennepin is in Minnesota). 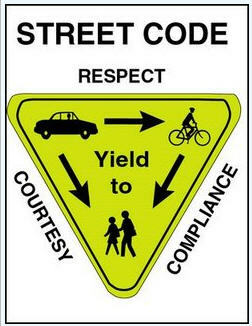 The idea is works is that legal responsibility for any accident on street, sidewalk or public space, is automatically assigned to the heavier faster vehicle. This means that the driver who hits a cyclist has to prove his innocence, as opposed to today where the cyclist must prove the driver’s guilt (not always very easy to do). I suppose there is a conflict if the heavier vehicle is not necessarily faster, or if you get the irrational (drunk) pedestrian or cyclist, but it seems a good heuristic that will give those who impose the greatest unsafety externality the incentive to yield. Note that all vehicles are expected to yield to trains, because trains can’t brake quickly (and they were there before cars in general), despite the fact that trains were heavier.